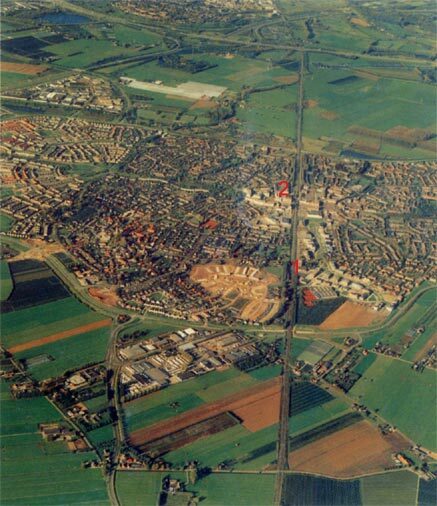 Houten from the air in 1997. 1 is the find-spot, 2 is the town hall. 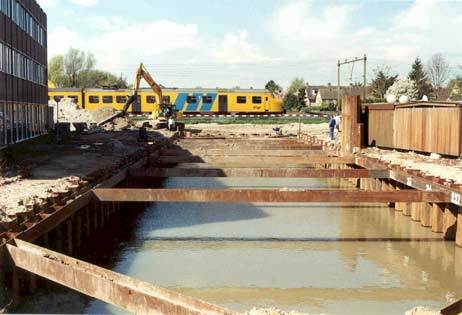 In the spring of 2000, a surprise find was made in the town of Houten, which lies roughly to the SE of Utrecht. 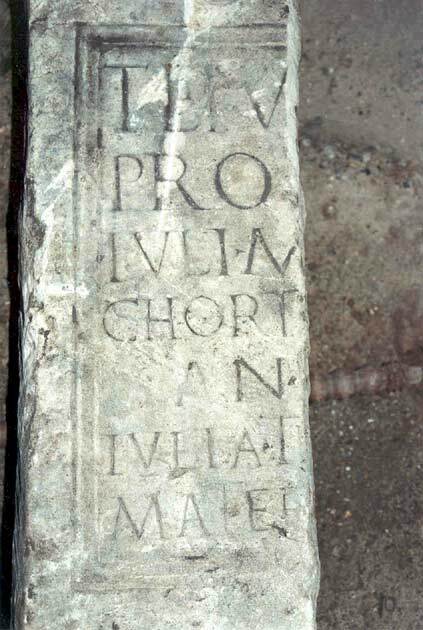 During the building of a cycle-tunnel under the Utrecht-Den Bosch railwayline, an amateur archaeologist by the name of Ben Elbertse found the remains of a Roman funeral stone. The earth from this development was dumped elsewhere, after which Mr Elbertse made his spectacular find. By itself this was no surprise because this area, which lies close to the old Roman border and just a few miles from the castellum Fectio, was already known for the existence of several Roman villas. However, apart from some small finds, there had never been anything like a gravestone found in the area. in the age of ? years (lies buried here). and heir of Tiberius had this made. This construction was based on a comparison by A.M.J. Derks (Vrije Universiteit Amsterdam) with similarly styled stones from the Rhineland around Cologne (K�ln). Such stones had a rough 'foot', a piece of text and a niche with a bust of the dead. The text is also based on educated guesswork with that sort of stones in mind. Such monuments are dated between 25 and 50AD, and just two more are known from The Netherlands. 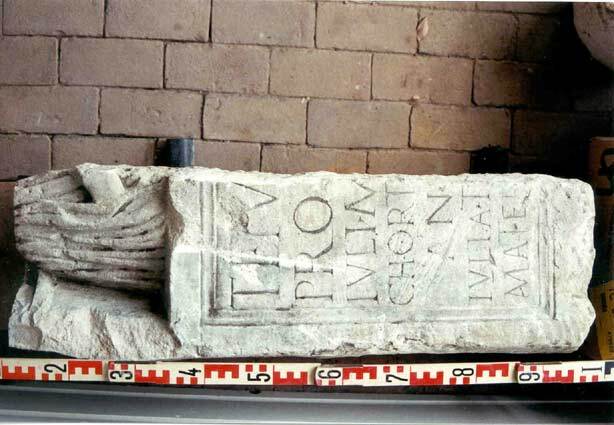 The original stone may have measured 150x50x20 cm and may have stood in the garden of a villa. 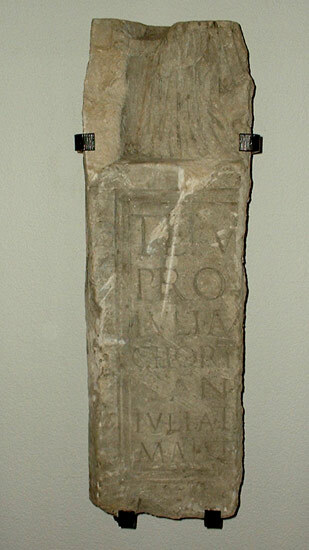 Who was this Tiberius Julius Probus? Apparently he was a soldier, born as far a way as the south of France (Fr�jus/Provence), serving in the auxiliary cohort called I Classica. This unit was raised by Augustus from soldiers of the fleet, and apparently it was moved to Fectio longer before the Batavian uprising in 69-70 AD then was originally thought. He is clearly wearing a toga, holding the hem with his right hand and probably holding a scroll with his missing left hand. This shows he was a Roman citizen, which complies with what we know of this unit, which was raised entirely from Roman citizens. The find-spot in the spring of 2000. The stone, shortly after its recovery. 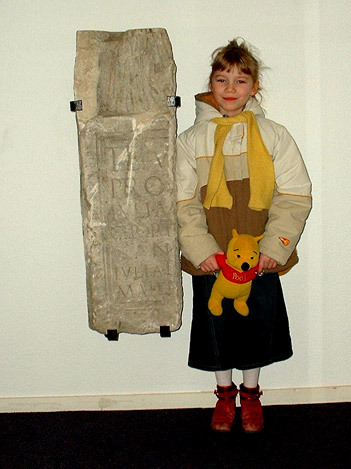 Marrit (7) next to the stone. I work for the council of Houten for some time now, and all along the stone had been kept in the town hall inside a glass case on the ground floor near the entrance. Suddenly it had vanished, luckily to re-appear again on the second floor, as it happened very close to where I work. The reason for this was the upcoming overhaul of the complete ground floor, although that meant withdrawing it from the public eye. Visitors will still have access to it when they ask to see the stone at the reception desk. I think I like it better this way - I can see it every day now! Anyway, I had my daughter visiting my working place and I could not resist shooting some pictures..
Krijg nou wat. Dit is �cht bijzonder/Wie was Tiberius Iulius de Brave?, Utrechts Nieuwsblad, 24 mei 2000.